Love has no barrier and is above all religion and races. 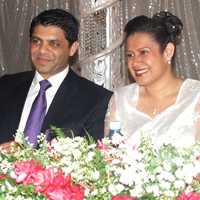 Those were the words of family and friends of the Attorney General Aiyaz Sayed-Khaiyum and Ela Gavoka who got married yesterday. The newly wedded couple had performed the muslim wedding ceremony or Nikah at Sayed-Khaiyum's residence yesterday morning and held the marriage reception at Novotel in Lami last night. Prime Minister, Commodore Voreqe Bainimarama also shared some light moments while giving his best wishes to the couple. The Attorney General also thanked all who attended the wedding and those who gave best wishes and said his wife Ela is a very wonderful human being who stole his heart in a very simple and down to earth manner. Meanwhile, the President Ratu Epeli Nailatikau, the Prime Minister and cabinet ministers, business houses, diplomats, family and friends were amongst the many who attended the reception.